Make an impact at your store opening or sales event. 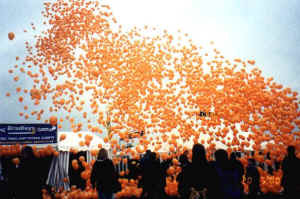 Thousands of brightly coloured balloons floating skyward provides a big event. Whether to open a store or sales event in style, supporting a charitable cause or a novel alternative to a prize draw, mass balloon releases are a winner. A balloon release will attract crowds and media, giving you the opportunity to spread your message to a much wider audience.